Hamilton snatched a share of the points against local rivals Motherwell in dramatic style as the Lanarkshire derby ended 3-3. 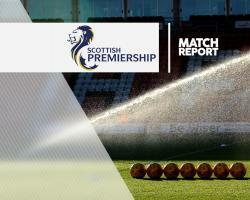 Just when it looked like Accies would suffer a fifth straight defeat, Ali Crawford netted from the penalty spot deep into injury time, as Keith Lasley saw red for the home side. Scott McDonald bagged a double for Well, with Lucas Tagliapietra and Darian MacKinnon both on the scoresheet for the visitors. Louis Moult thought he had grabbed the winner in the Ladbrokes Premiership clash - until the last-gasp flashpoint. Motherwell headed into the match looking to extend their winning streak to four games. And they enjoyed the best possible start after surging into the lead after nine minutes.Josh Law supplied a low cross into the box from the left and McDonald had the final touch as he tapped home from close range. The striker was threatening again moments later, this time stinging the palms of goalkeeper Michael McGovern at the near post. At the other end, Eamonn Brophy tried his luck with an effort from just inside the box that trickled past the upright. Accies had another chance to haul themselves level but Well goalkeeper Connor Ripley did well to block Crawford's powerful free-kick. The visitors' pressure paid off when they restored parity after 25 minutes.Crawford whipped a free-kick into the packed goalmouth and Tagliapietra rose above everyone else to bullet home the header. And Accies were ahead just three minutes later when MacKinnon let rip with a shot from distance that left Ripley with no chance. Motherwell could have levelled just before the break but Marvin Johnson's ferocious volley was blocked by MacKinnon. However, the home side were back on level terms less than a minute after the start.Moult picked out McDonald in front of goal and he initially failed to connect with the ball, before stabbing into the back of the net at the second attempt. Moult was on the scoresheet himself after 57 minutes with a diving header from Liam Grimshaw's cross. Well were determined to snuff out the possibility of another Accies comeback but Johnson was denied a goal by a decent save from McGovern.Hamilton were dealt another blow when Tagliapietra left the pitch on a stretcher with five minutes to go.